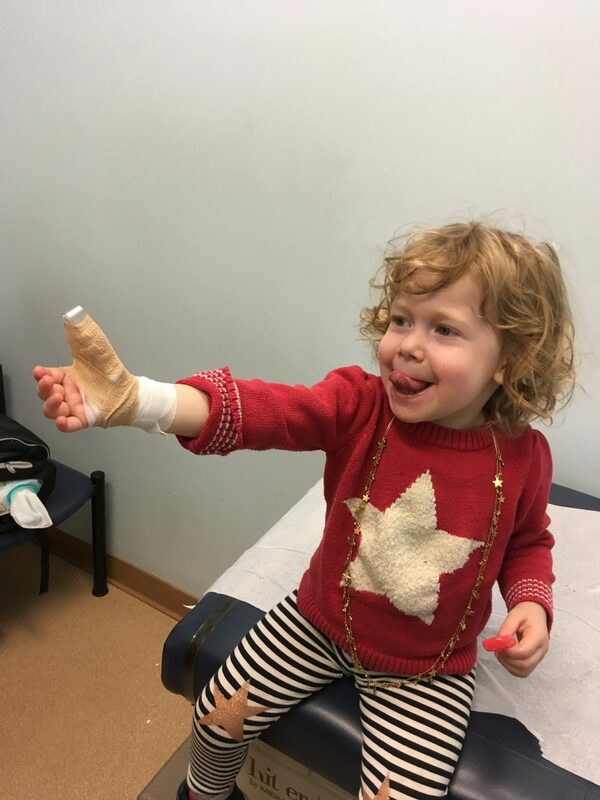 Robin, my granddaughter, broke a finger today when it got caught in the hinge of a Brooklyn restaurant door. She ended up at the emergency room and has to go see a specialist tomorrow. It was a rough afternoon for everybody, but Robin seems to be handling it well. I gather it was pretty painful. It will be a difficult couple of weeks for her parents, she’ll need a lot of help eating and dressing, even playing. Oh what a shame, sorry to hear. Robin seems a real trooper with her “thumbs up” attitude! Wishing her well and a speedy recovery. Oh no. Poor little thing! Feel better Honey! Oh that must of really hurt ! Quite the bandage on a little thumb which Robin seems quite proud of. Heal quickly, Robin. She looks amused by it! But it must be very sore. I hope no serious damage.